So you will never have to rummage for that witch hat, ever again! Have you ever experienced rummaging through your closet right on All Hallow’s Eve, trying to find your son’s Hulk costume or your own cute witch’s hat? We are sure you probably ended up buying a new one, instead! Kids usually just leave their costumes in a jumble post-Halloween, with the witches’ capes mingling with the Avengers’ muscle suits. Sort them by costume: place all the princess ballgowns and tiaras in one pile, all the Dracula capes and masks in another, and so forth, so that the pieces won’t get lost. The same goes for décor; if your candles and votives can still be used, remove the melted wax and put the votives back in the box. Halloween hangings and buntings should be folded and put away. Fresh carved pumpkins, of course, should be discarded before they rot! While you’re sorting, figure out which costumes you want to keep, discard, or give away—that bumblebee baby onesie may be too small for your toddler next year, but there must be someone out there who will need it. You can pass outgrown costumes on to a friend or relative, or go to one of those Facebook selling sites to peddle your purges. This should be ideally done the day after Halloween—there’s always going to be some candy goo or smeared makeup on the costumes. Spot-treat and hand-wash the fabric costumes; delicate or spangled costumes should be dry-cleaned. Masks should be wiped with a clean rag, and powdered with cornstarch or talc so that the parts wouldn’t stick together. Wigs should be washed, dried, and combed out, and if you can, place them on mannequin heads. Halloween décor should all be wiped down and cleaned of any spilled wax (or fake blood) before storing. Sewing up a torn costume that you’ve just discovered right before Trick-or-Treat is so stressful! Before you store your costumes, check each one for any tears or damage and sew them up immediately. Fix any broken décor, glue together broken ceramics, and discard anything that is mangled beyond repair. Storage techniques differ per costume and décor type. But for easy storage, place each costume in a zip-up garment bag, and include the costume’s mask or props so these won’t be misplaced. Hang the garment bag in your child’s closet. Fairy and angel wings should be hung on pegs or hooks so these won’t be crushed. Stuff a witches’ hat with a roll of newspaper to help it maintain its shape. Store upright in a closet shelf. If you have young children, you may want to hang the costumes on a peg rack in their bedroom so they can play dress-up whenever they please. Launder or clean the costumes as needed. Unusual or large costumes (like robots) should be dismantled and stored in individual, large plastic storage bins. Add a silica gel packet to keep moisture at bay. 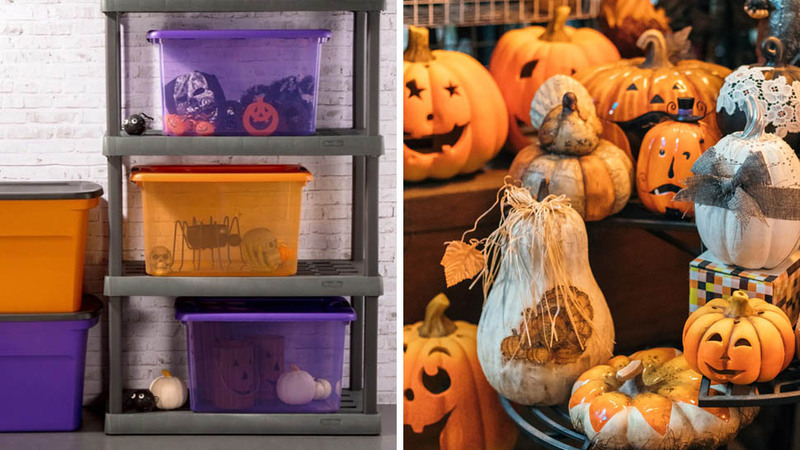 The same goes for Halloween décor—store them in plastic bins or organizers (with tight-fitting lids so dust won’t get in) to stash in your bodega or garage. If you have large and unusual Halloween decorations like fake skeletons and skulls, store them in unused luggage. Remember to label them so you won’t have a fright later on!